This costume is perfect for Halloween as a couples costume when paired up with a beer garden girl, for Oktoberfest, or German/Bavarian themed masquerade costume parties. 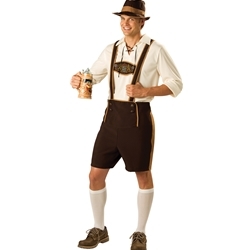 The Bavarian Guy adult costume is colored as pictured. Costume includes lederhosen, shirt with lace-up collar, hat, and knee socks. Costume is available in adult men’s size medium or extra large.